Firefighters are as close to superheroes as we’re likely to see on Earth. But there are some things even they can’t do. That’s why we’re working on autonomous systems that can be used by firefighters and first responders to access areas, and save lives, where humans otherwise wouldn’t be able to. It’s just one example of our world-leading work in robotics and cyberphysical systems. Bringing minimally-invasive, high-precision automated surgical techniques to doctors, enabling military field personnel to safely dispose of explosives, assisting stroke victims in recovering motion, enabling swarms of drones to self-organize on the battlefield – researchers at UCLA are using humanoid and non-humanoid mechatronics technology to make life better for the humans on the planet. All that, and a team that’s developing soccer robots that compete (and win) in World Cup-style competitions. Their goal: to be able to beat the actual World Cup Champions in soccer… by 2050. Want to see the future through the eyes of a robot? 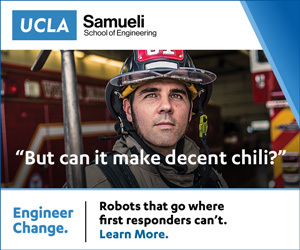 Check out what’s going on at the UCLA Samueli School of Engineering. Click on the links below to visit some of our labs. Working on projects on cooperative motion and swarming, including the mathematical properties of collective groups and the large scale dynamics that ensues from small scale motion. Dedicated to improving quality of life by enhancing the functionality of artificial hands and their control in human-machine systems. Developing develop science, technology, and human resources at the interface between robotics, biological systems, and medicine. Pursue a unified framework for representation, learning, inference and reasoning, and to build intelligent computer systems for real world applications. Projects span four directions: Vision, cognition, learning and autonomy. Director: Song-Chun Zhu, professor of computer science and statistics. Conducts research in computer graphics, computer vision, medical image analysis, computer-aided design and artificial life. Research in neuronal control mechanism of animal locomotion, nonlinear oscillators, global pattern formation through local interactions, and robust/nonlinear control theory and its applications. Research in modeling, analysis, control, and security of real-time, embedded, networked and distributed cyber-physical systems. Information theory and its applications to wireless and sensor networks; network data compression and storage; network secrecy; machine learning and large scale data analysis algorithms. Focuses on servo control with applications in precision machining, engine control and nanopositioning. Research in embedded and cyber-physical systems for applications in Internet of Things (IoT), ubiquitous and mobile computing, and pervasive sensing and control. Humanoid robots and novel mobile robot locomotion strategies. Research interests are in the area of robot locomotion and manipulation, soft actuators, platform design, kinematics and mechanisms, and autonomous systems. Investigating how images can be used to infer properties of the physical world such as shape, motion, location and material properties of objects within. Such understanding is key to developing engineering systems that can “see” and interact intelligently with the world around them.